January 20 is Baba Den or Grandmother’s Day for the Goddess Baba Yaga. The following ritual can be used to connect with Baba Yaga in her aspect as helper and wise woman. 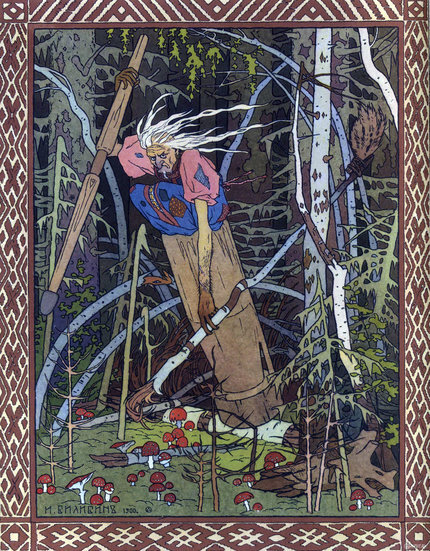 The best time of day to connect with Baba Yaga is noon. Her planet is the Sun and Her element is fire. Incense made with sunflower petals (if available), bay leaves, and /or copal - be sure to grind the incense in your Mortar and Pestle. It is sacred to Baba Yaga and her principle means of transportation, She rides through the sky in Her Mortar and steers with Her pestle. Cast your Circle in the usual way. Light the charcoal and place it in the incense burner. Once it is glowing red hot, add your incense. Continue to add incense throughout the entire ritual. Place the bowl of water and the stones in the centre of the Altar directly in front of you. I call upon the power of the Ancient Grandmother Baba Yaga. I invite you into my Circle. I honor you with these gifts. Place your offerings in the center of the Altar in front of the Baba Yaga candle. Carve your name or sigil on the candle that represents you and anoint it with the oil. As you are dressing and blessing your candle, chant your name. Light the candle that represents you and place it at the farthest right corner of your Altar. Say something like: This candle represents your name. Baba Yaga I wish to draw closer to You and experience your wisdom. I search for you in the birch forest. At the edge of the underworld. Drop one pebble in the bowl of water and move your candle a little closer to the Baba Yaga candle. Teach me the ways of the Crone. The ways of living and dying. The ways of strength and yielding. You are untamed and unapologetic. And bravely face the door. All that is a burden. In your chariot that is a mortar. Take a few moments to experience your connection to Baba Yaga. Listen to whatever She may have to say to you. Her words may come to you as a vision, or as a scent, or as a bird singing. Pay attention to everything around you, for all is Divinity. When you are finished thank Baba Yaga for joining you. Extinguish the candles and open the Circle. Take the offering outside and pour or place it on the ground.